Guarding the port of Long Beach, California, the retired British ocean liner floats silently like a ghost. The Queen Mary’s construction and launch was nothing short of extraordinary and her story is very unique. Despite being built in the era of the Great Depression, the ship was destined from the start to stand out. With a desire to replace the Mauretania, Cunard Line spared no expense, building the most luxurious and technologically advanced ocean liner at the time. Legend has it that when the ship was ready, the board of directors at Cunard had decided to name her the Queen Victoria. The delegation went to ask King George for his blessing on the proposed name, saying: “We have decided to name our new ship after England’s greatest Queen.” They were referring to Queen Victoria, the King’s Grandmother, but the King is reported to have said: “My wife (Queen Mary) will be delighted that you are naming the ship after her”, hence the name Queen Mary. The Queen Mary was designed for transatlantic travel and was equipped with five dining rooms and lounges, two cocktail bars, swimming pools, a grand ballroom, a squash court and even a small hospital. The ship was boasting elegance and grandeur. She was the grandest ocean liner in the world, carrying Hollywood celebrities like Clark Gable, royalty like the Duke and Duchess of Windsor, and dignitaries like Winston Churchill. But as World II started, the Queen Mary was transformed into a troopship, painted a grey color for camouflage and stripped of her luxurious amenities. Nicknamed the “Gray Ghost” because of her stealth and plain color, the ship was the largest and fastest troopship to sail. She was capable of transporting as many as 16,000 troops. After the war, the Queen Mary underwent major retrofitting and was brought back to her original splendor. She resumed regular passenger service across the Atlantic for the next two decades. In the 1960s, as people started using air travel for their transatlantic voyages, the ship’s popularity decreased more and more, so Cunard decided to sell her. In October 1967, the Queen Mary departed on her final cruise arriving in Long Beach, California, where she has been floating ever since. The ship is now Hotel and an Event Venue. She is home to three world-class restaurants and can be visited daily, from 10:00 a.m. to 6:30 p.m. You can tour the Queen Mary at your own pace with an audio tour, or join one of the various guided tours. There are several twilight tours for the ghost lovers (Paranormal Investigation, Paranormal Ship Walk, Dining with the Spirits). On February 5, the Queen Mary will be visited by Cunard’s newest ocean liner, the Queen Elizabeth, who will be making a stop in Long Beach. This ‘Royal Rendezvous’ is the fourth time in over three decades that another Cunard ship has visited the legendary Queen Mary. 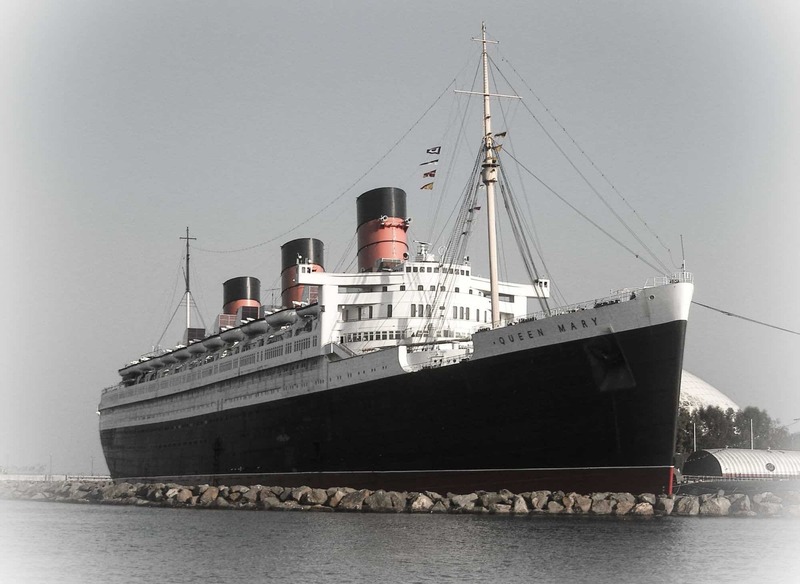 The Queen Mary is a great ship with lots of history, a nostalgic reminder of a bygone era. It's always really interesting to find out about the history of a ship, especially when they have a past as interesting as this one! Have you been on it now it's got the works class restaurants on board? I need to get down to Long Beach to see the Queen Mary! I have seen it briefly during a music festival years ago, but I was not in the right frame of mind to really let it all soak in. I lived in Long Beach for awhile and admired the Queen Mary from afar. It wasn't until we had a wedding nearby that I returned to tour the ship and enjoy the Sunday Brunch. Loved the retro feel and Art Deco embellishments. Glad I didn't run into the legendary ghost. Me, neither, Elaine. I'd love to do the ghost tour. That's so cool that the ship is a hotel now! I would love to spend the night and just learn about all of the history. I wonder if it's haunted since it's so old and has been through so many hands/repairs. Now I want to go to Queen Mary. Thank you Vlad. This is an older picture. Hope you'll come back to visit Queen Mary, Linda. I've always admired the Queen Mary whenever we go to Long Beach. Although, we've never gone inside for a tour. I'd also want to spend the night one of these days. It has such a rich history. Thanks for all the interesting information. I like the idea of the ghost tours. They say that statistically most cruises have a few deaths. I haven't been on the Ghost Tour, but I'm tempted to try it sometimes. I am only 45 minutes away from Long Beach.